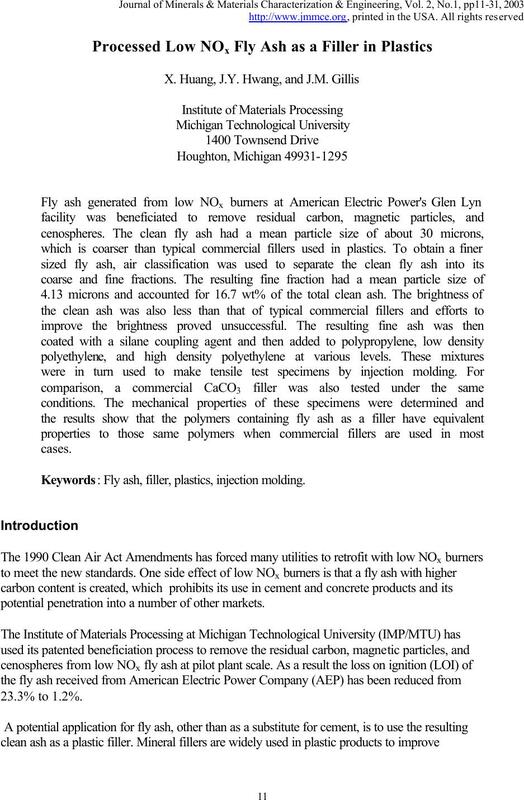 Keywords: Fly ash, filler, plastics, injection molding. potential penetration into a number of other markets. accounts for about 70% of the fillers used. fraction and improving its brightness while evaluating its performance as a plastic filler. the cut. 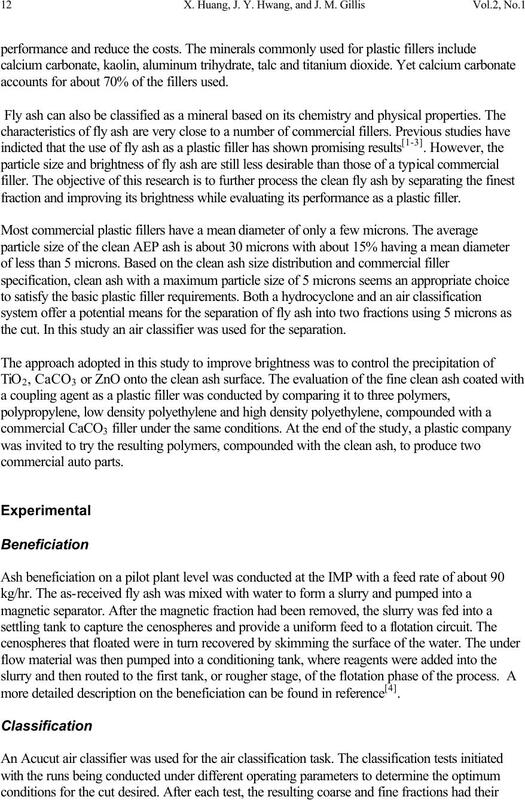 In this study an air classifier was used for the separation. 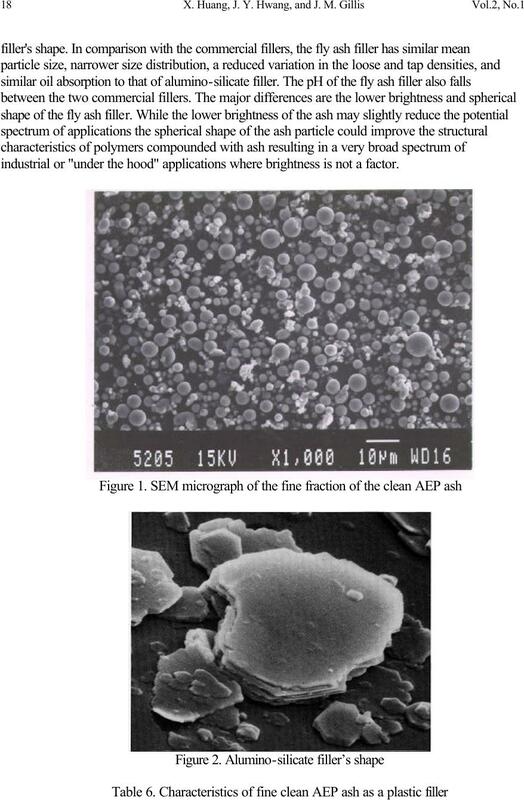 used to produce more than 3 kg of clean AEP ash with a particle size of less than 5 microns. 95.9%. 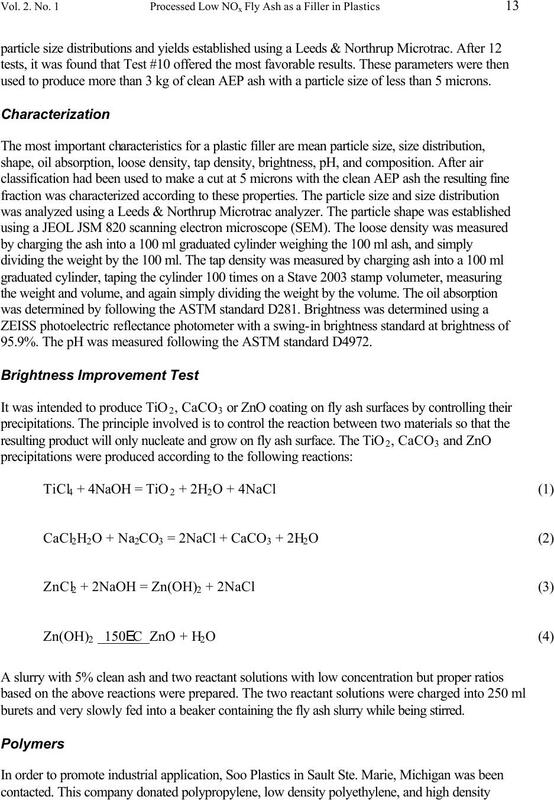 The pH was measured following the ASTM standard D4972. burets and very slowly fed into a beaker containing the fly ash slurry while being stirred. 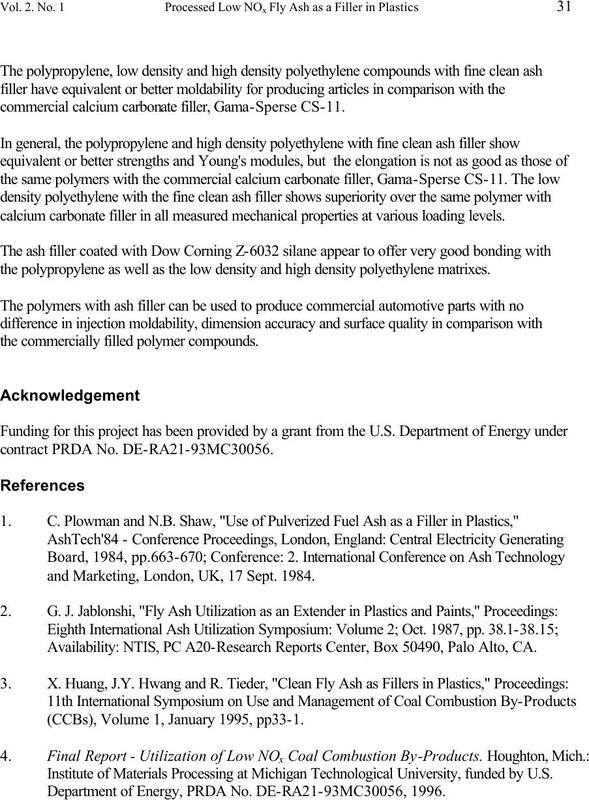 polyethylene, which are currently being used by Soo Plastics, to IMP/MTU for this research. project. 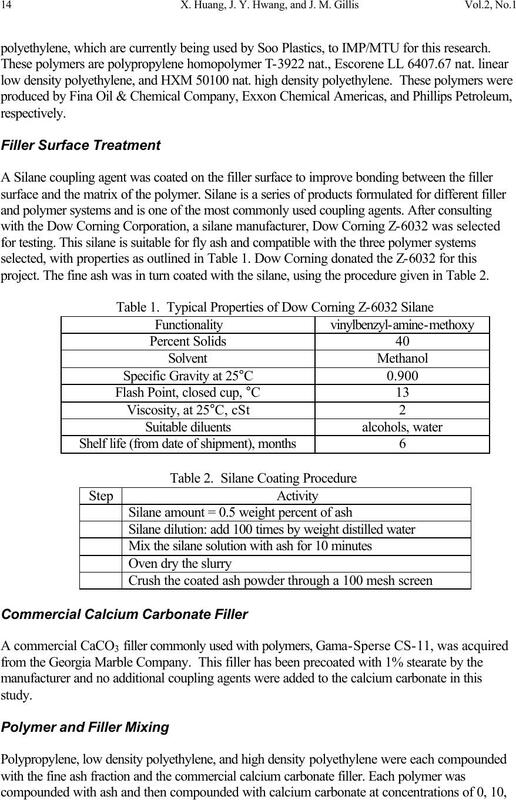 The fine ash was in turn coated with the silane, using the procedure given in Table 2.
moldable, ten tensile specimens were produced from each batch for mechanical testing. tensile specimens to examine the bonding between the polymers and the fillers. into the barrel of a commercial injection molding machine. 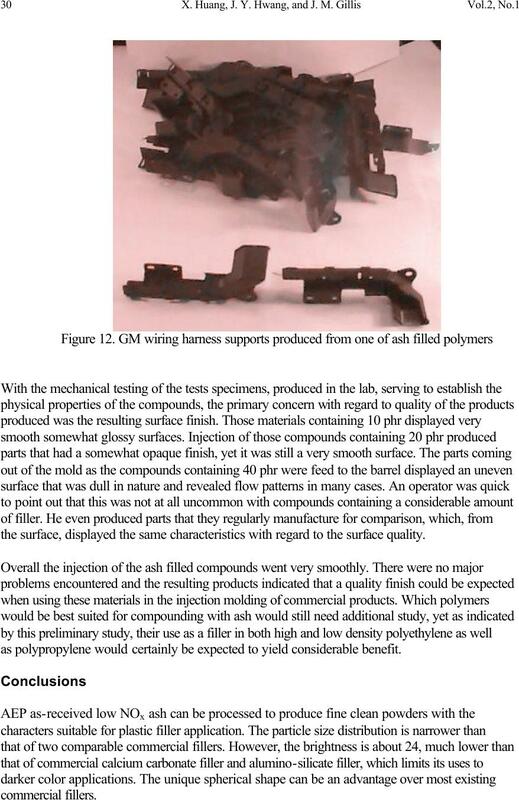 quality that could be expected from compounds containing fly ash. 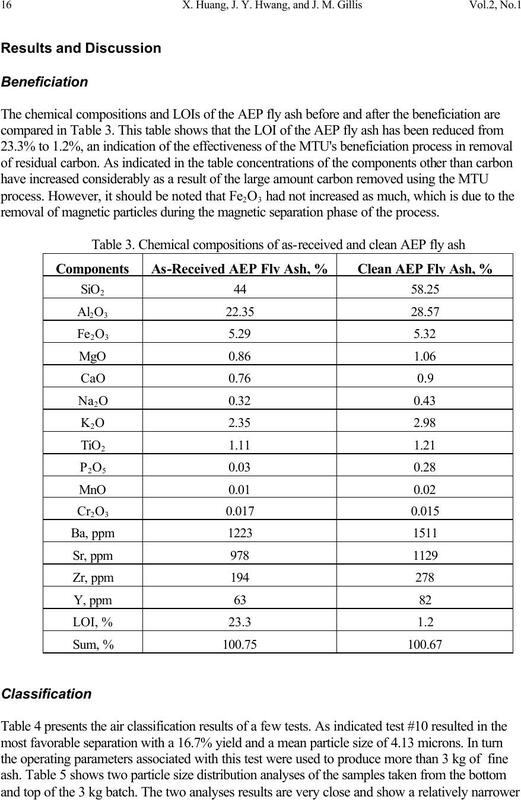 removal of magnetic particles during the magnetic separation phase of the process. 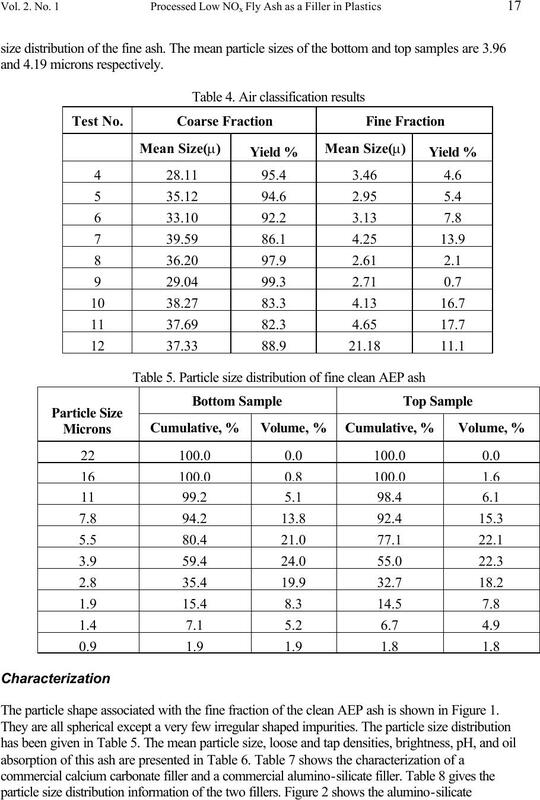 The particle shape associated with the fine fraction of the clean AEP ash is shown in Figure 1.
industrial or "under the hood" applications where brightness is not a factor. be that the coating was too thin. 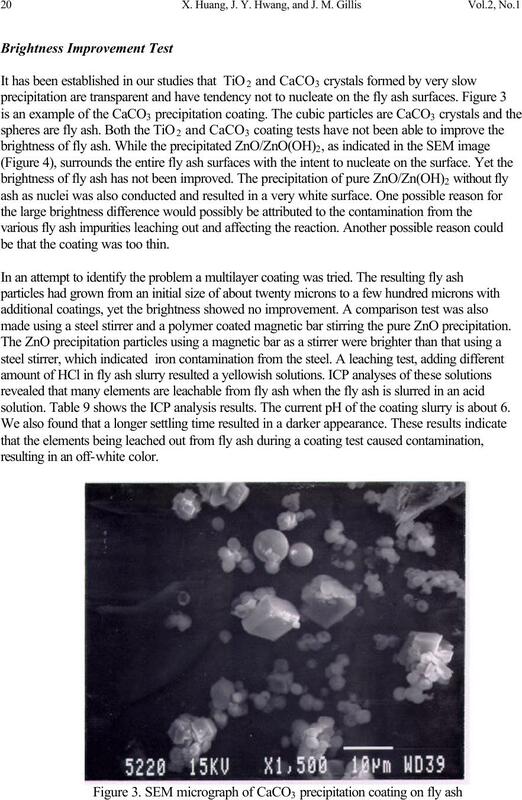 made using a steel stirrer and a polymer coated magnetic bar stirring the pure ZnO precipitation. solution. 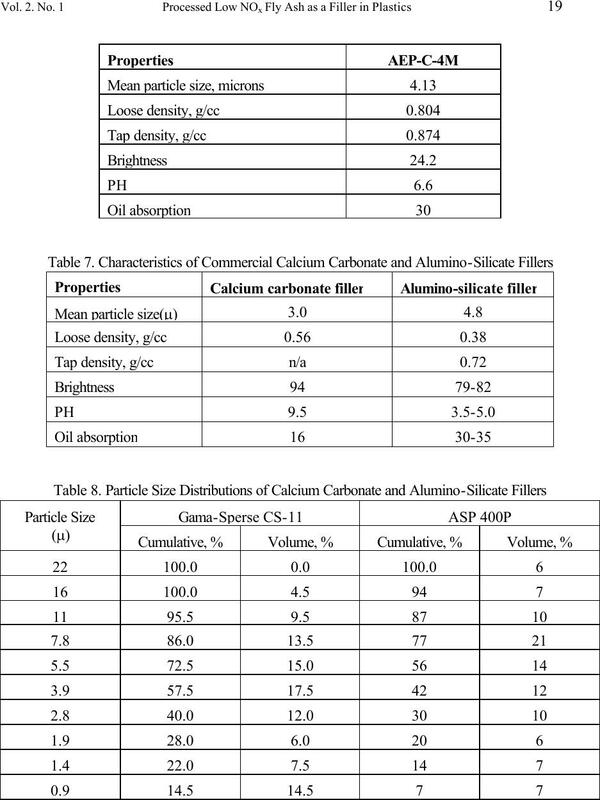 Table 9 shows the ICP analysis results. 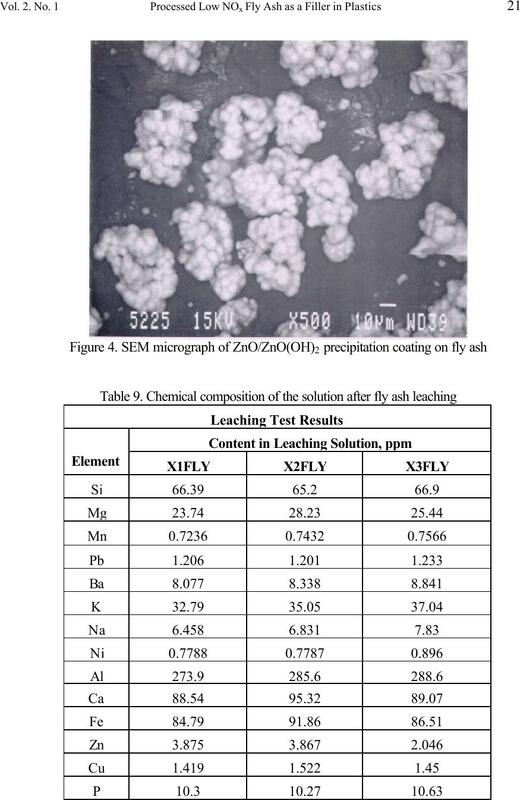 The current pH of the coating slurry is about 6.
resulting in an off-white color. commercial calcium carbonate fillers used. 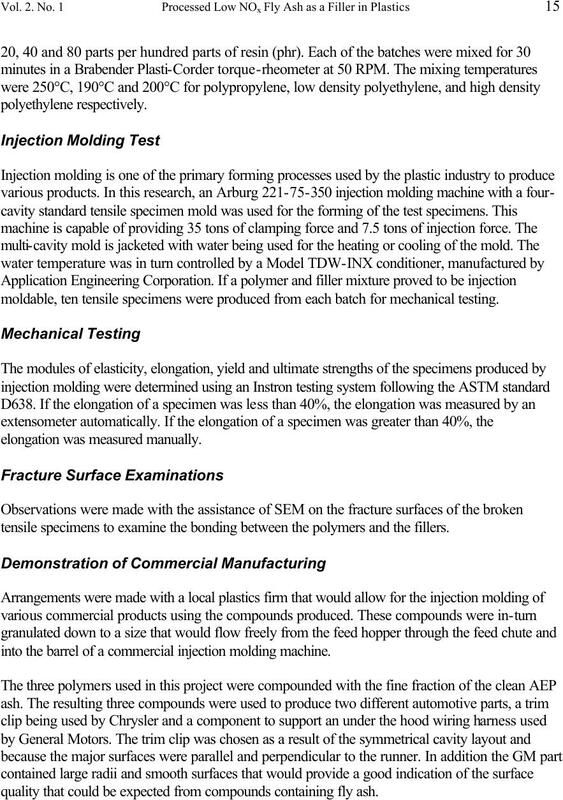 molded under the conditions listed in Table 10.
compound still could not be injected into the cavity fully. compounded with a commercial calcium carbonate filler. 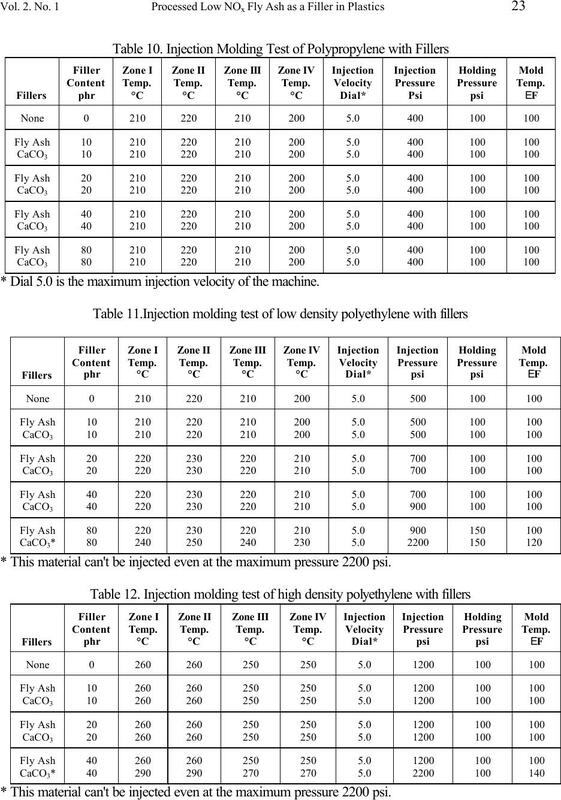 * Dial 5.0 is the maximum injection velocity of the machine. * This material can't be injected even at the maximum pressure 2200 psi. UTS. 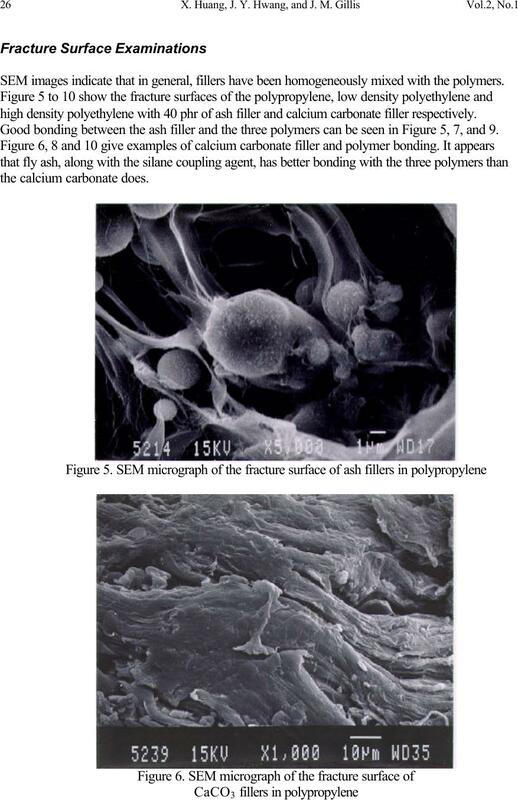 With regard to size the larger particles usually reduce the UTS and elongation. content is less than or equal to 20 phr. obvious at the higher loading level of 40 phr. not as good as its counterpart. 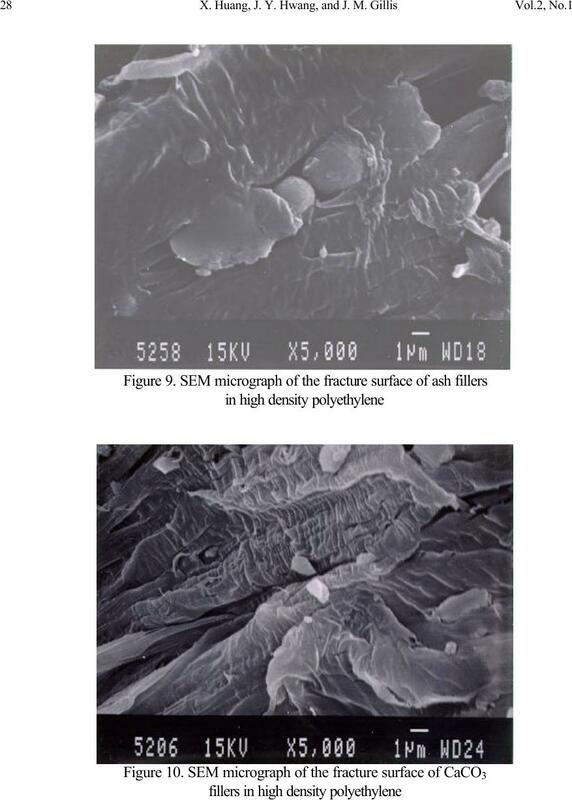 SEM images indicate that in general, fillers have been homogeneously mixed with the polymers. 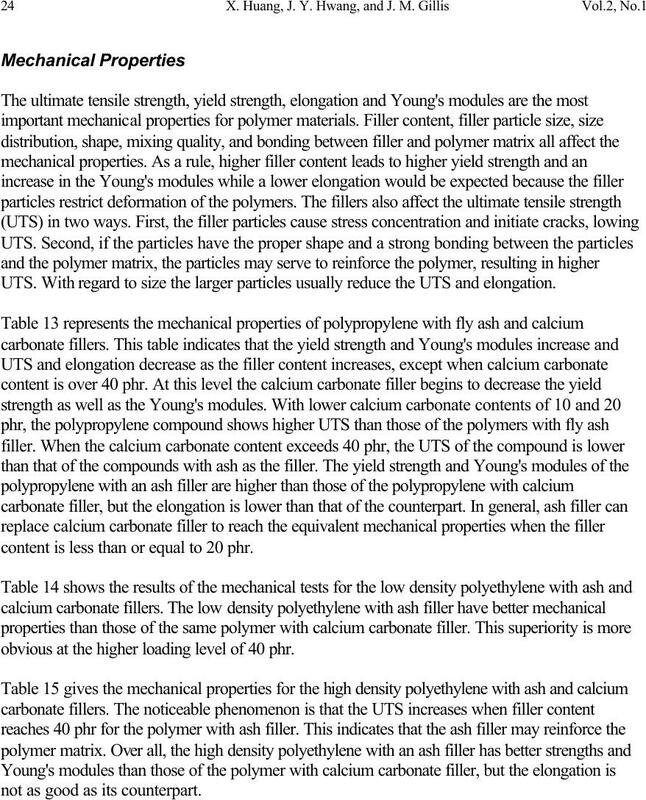 high density polyethylene with 40 phr of ash filler and calcium carbonate filler respectively. 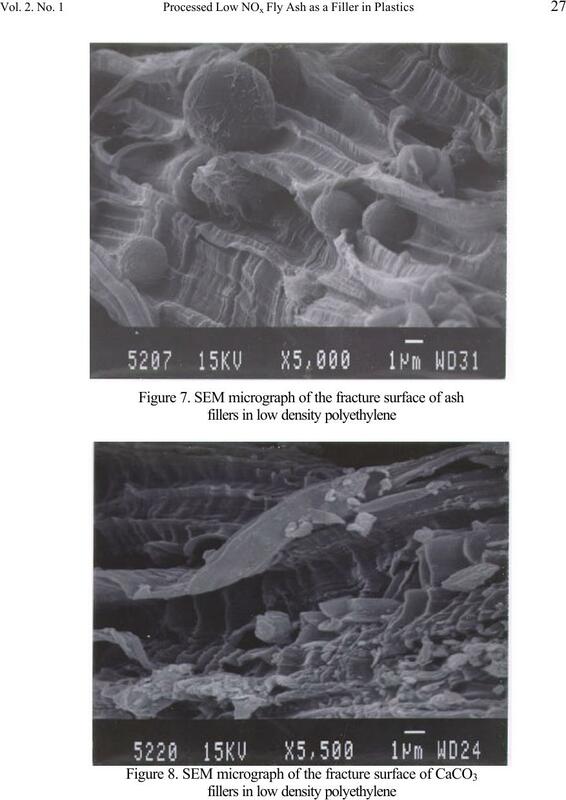 Good bonding between the ash filler and the three polymers can be seen in Figure 5, 7, and 9. 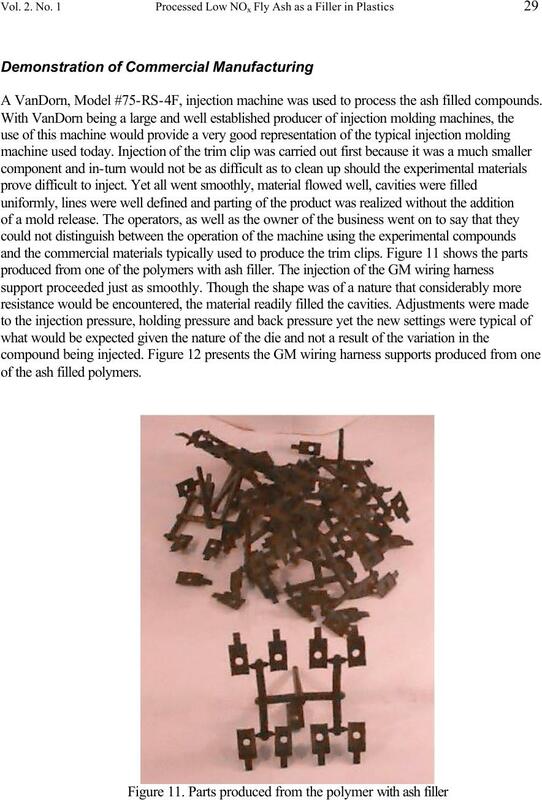 A VanDorn, Model #75-RS-4F, injection machine was used to process the ash filled compounds. 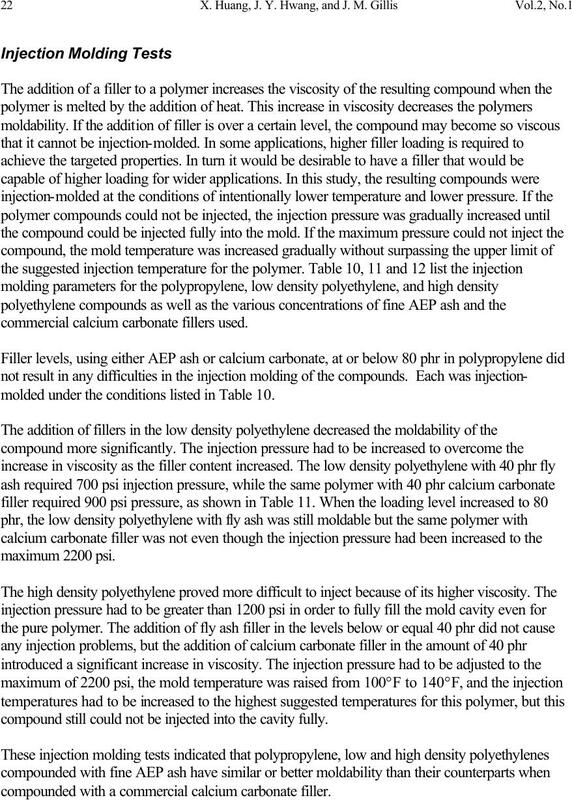 of the ash filled polymers. the surface, displayed the same characteristics with regard to the surface quality. as polypropylene would certainly be expected to yield considerable benefit. commercial calcium carbonate filler, Gama-Sperse CS-11. 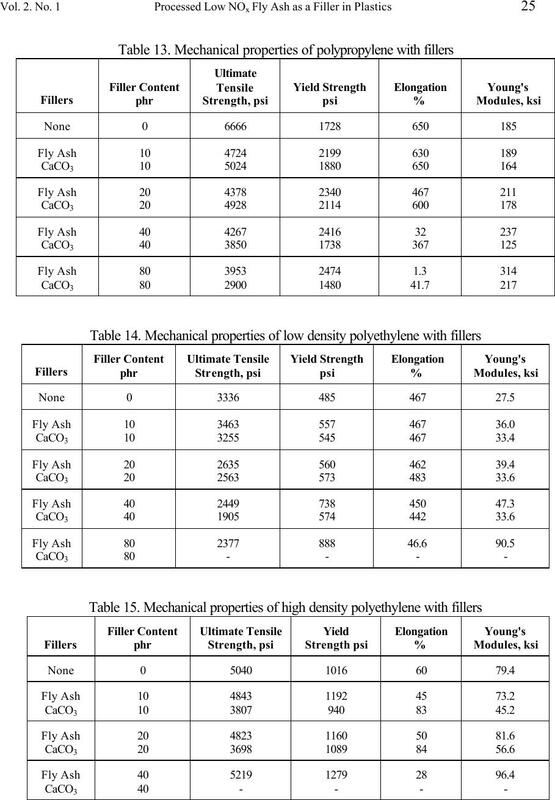 calcium carbonate filler in all measured mechanical properties at various loading levels. the polypropylene as well as the low density and high density polyethylene matrixes. the commercially filled polymer compounds. 1. C. Plowman and N.B. Shaw, "Use of Pulverized Fuel Ash as a Filler in Plastics,"
and Marketing, London, UK, 17 Sept. 1984. Availability: NTIS, PC A20-Research Reports Center, Box 50490, Palo Alto, CA. (CCBs), Volume 1, January 1995, pp33-1. Institute of Materials Processing at Michigan Technological University, funded by U.S.
Department of Energy, PRDA No. DE-RA21-93MC30056, 1996.